Murf, Have you had any experience with performance dropping in the 7.3 L turbo diesels that were in the Superduty's before the 6.0 came out? Mine seems to be acting a tad sluggish and hates cold starting much worse than in previous years. It's a 2000 model F250 and has 125k+ miles on it. I'm good about changing the oil and air filters. I'm due for a fuel filter, though. Do the injectors wear out or any other items that could be causing the cold start issue? It hasn't failed to start yet, but it has died several times before it'll stay running. That's after sitting outside all day while I'm at work. I garage it at home. Check total resistance on glow plugs, (if it has them? )maybe a bad one or two? What is you fuel condition? Is the supply fresh? What oil are you running? 15w40 is good, but motor will turn slower. New fuel filter may help. How old are your batteries? Been checked lately? AV8R is on the right track. Check each glow plug INDIVIDUALLY, if any are too high or low in resistance change them. Another known problem is that when they get older the relay that powers the glow plugs gets weak and drops the power to them prematurely. Give me a little detail on cold starts, and especially the stalling part, there are a few other possibilities. Well, when the truck was younger, if it sat outside all day at near 0 degrees F it would catch and then surge repeatedly which rocked the truck back and forth. It would surge maybe half dozen times before settling down to idle and warm up. Then on the first cold day this winter/fall, after sitting out overnight and all the next day at about 25+ degrees or so, it would catch, surge up and then die. It did this about 3 times before it finally caught, surged a couple of times, then settled down to idle. During the summer, my mileage held around 16 to 16.5 mpg. That's running about .5 to 1.0 mpg lower than previous summers. Not a huge difference, but disappointing as the egine should be broke in by now. One noticeable trip which was all highway had mileage in the low 16 mpg range when in the past it was typically 17-18 mpg. It was not a noticeably high wind day either. I also noticed the truck doesn't have the same get up and go as it used to. No hard data, but she took a lot longer getting up to 80 mpg in passing a car than it had in the past. That's what got me paying more attention to it. The fuel should be fairly fresh as I usually run through a tank a week (25+ gallons). Sometimes more, sometimes less. As for the oil, I run the Rotella the truck place puts in it. I've run that since the first oil change way back. I'm not sure exactly the grade designation as they hold it in those huge multi-thousand gallon tanks. But I suspect it's 15W40. Batteries are still stock items. Truck bought in March, 2000 so that puts them at about 5 years old. Note: I've never used any diesel fuel treatment in the truck. Should I? And any recommendations? In winter, the place I buy diesel from uses pre-blended fuel and I've not had problems with it the two previous winters. If the motor is electronic (I think it is in 2000?) the old batteries may be your problem. Definately check them, they are surely at their end-of-life. Could be the source of a glowplug issue too. With only 125k I wouldn't think you have worn out the injectors, yet. My '86 VW had 240k before I had to replace those. Have you ever had fuel problems? How old is the fuel filter? Try putting a heavy dose of gravy (fuel service, etc.) in the fuel and see what that may do for injector build-up. Couple of things, based on more information. First and foremost, load test each battery separately, this requires removing the wire on the one that goes through to the other. If one, or both batteries are low, replace it or them. Next, test each glow plug, again independently of the others. If one or more are noticeably different on a digital Ohm meter, change it or them. Next, if the current fuel filter is more than 6 months old, change it, drain the water seperator and give it a heavy dose of diesel additive, good stuff Power Service or equivalent. A healthy regular dose does wonders at the best of times. Water up next to the injectors will also create the symptoms you are describing until things warm up and melt the ice. You mentioned that the place that changes your oil uses Rotella, but the problems you describe also could be caused by inferior or wrong grade oil. 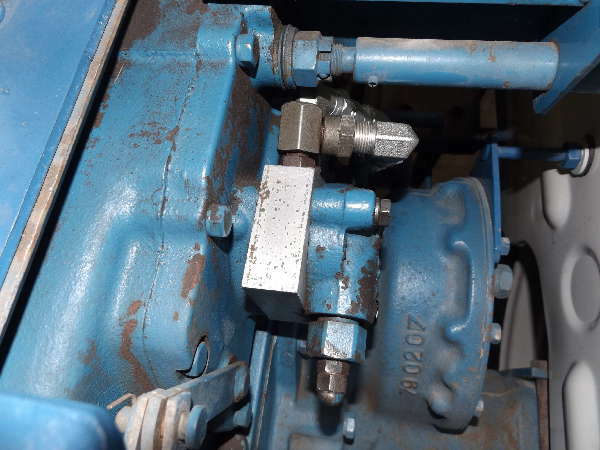 A PSD motor's injection system requires an oil with very high anti-foaming properties. This is why you can feel it with your right foot when the truck needs an oil change, viscosity and additives are the first elements to break down in an oil with use and age. As for 16 mpg that doesn't sound right either. I would have to guess that your truck has a 4.10 rear end, there is no way the mileage should be that low with a 3.73 rear end. Murf, she's got a 3.73 rear end in it. The best mileage I got was a road trip at 70 mph that got me about 18 mpg. I'm usually doing more stop and go during the week when driving back and forth to work. It's about a 14-15 mile trip with two stop signs, one speed trap and 2 or 3 road turns (no stop signs). It's also hilly so that can impact mileage. So I usually fair worse for those fuel runs, typically 16.4 - 16.5. So running 16 mpg flat is noticeable. I've got a new fuel filter I'll get installed and I'll drain the water trap. I'll try to find the fuel additive and see what that can do for me. Thanks for your help. I'll also check the glow plugs, but may have to wait until I'm past Christmas. I'm pretty booked up and I get to go to Fargo for a week (next week). Woohoo! Hmmm, that doesn't sound right. I forgot to ask, and it shouldn't make a difference at road speed, but is your truck an automatic or manual ? My personal ride is a 1999 F-350 DRW Crew Cab 4X4 (see my picture # 19) and is heavily 'tweaked' and still squeezes off about 18'ish mpg around town and 21 or 22 on the highway. I can't believe you'd be that far behind with a stock rig. Murf, she's a stock rig. 2000 F-250 SuperCab (Not crew)4x4 with automatic trany (wife can't drive a stick, I tried to teacher her, but...). But after 125k miles and nothing to clean the injectors, I'm suspecting they are pretty dirty. I picked up some power source additive for the fuel last night. I'll get that installed and run a tank or two through and see if that makes a difference as well. I'm not complaining too much about the mileage as it's still at least 50% better than my buddy with the 5.4L gas engine in his truck.